oh Mo it is absolutely beautiful!!!!! thank you Blanca, I love how the rose dried so perfectly! Beautiful Mo, my daughter’s garden, well ours really has a grape vine but it doesn’t seem to get tendrils, hoping it will sometime. It’s a 25 year old vine in an indoor atrium that shades their big dining table in summer, we cut it back every autumn to allow light & warmth for winter (it has under the floor tiles heating as well) I could live in that room! 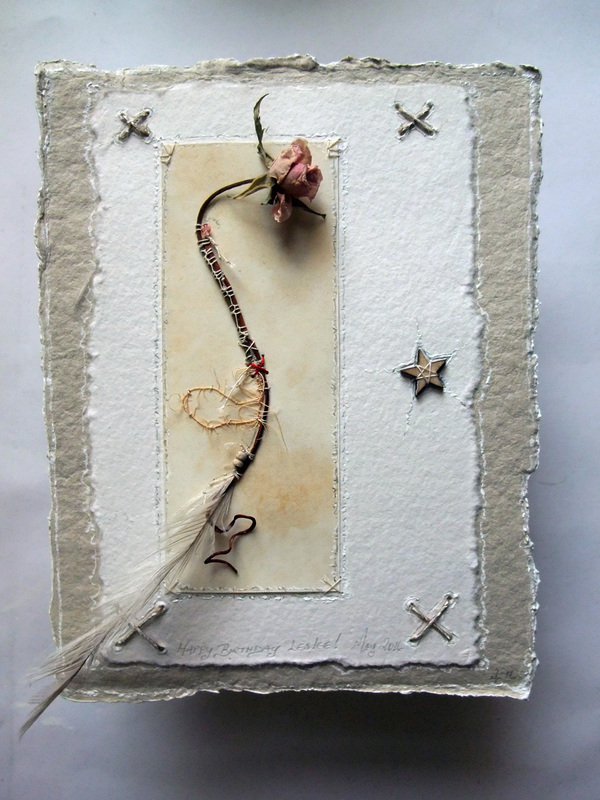 I could make these little pages for the next ten years with all the found treasures, cloth and paper I have lying around here! 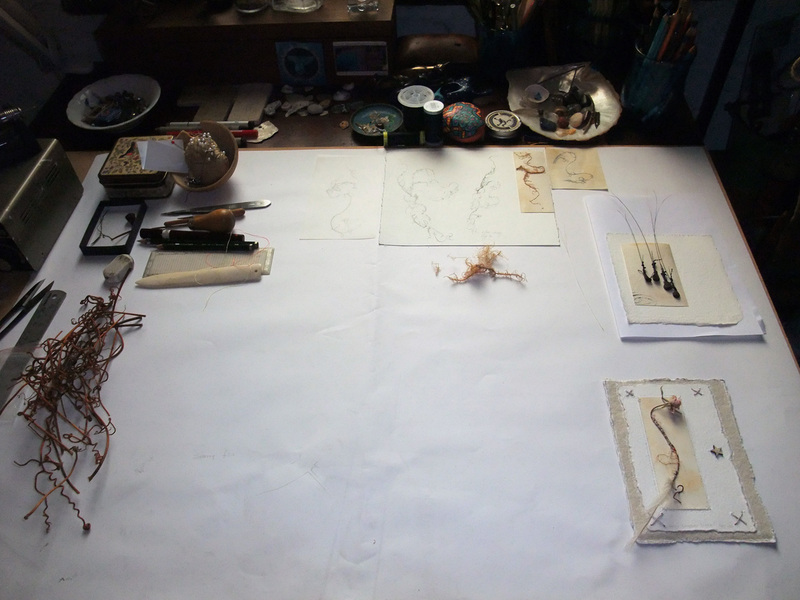 but there are so many other dream things asking to surface + the 100 crow books to hand colour and stitch in their heart talismans for the Crow Show, will get started as soon as the printer tells me they are ready… really I need at least another 50 years or perhaps another lifetime! Ready for someone else to bring to life. I’ll bet the Cecil Brunner still has that amazing clovey perfume- it always reminds me of my grandmother, one of my favourite roses! one day? amazing. a lovely present. a new technique for drying roses! I almost can smell them Mo…………. I love the rose card too Mo but that cleared table is what excites me……… a blank space waiting to be used and for another dream to come to life. And the way your hand conveys touches of graphite and gouache so gently they might float off the page. Really, you make my heart happy! Some of my favourite things here, Mo! Somehow you have magicked them into such a work of art… Truly beautiful! that tiny rose dried so perfectly it needed a setting! the rose, yes, and its stem stitched up, are beautiful, but I think what I love the most is the star within the star — you make the most tender and exquisite details. thanks Dee, I do enjoy the fine details but most of my friends can’t see them any more!